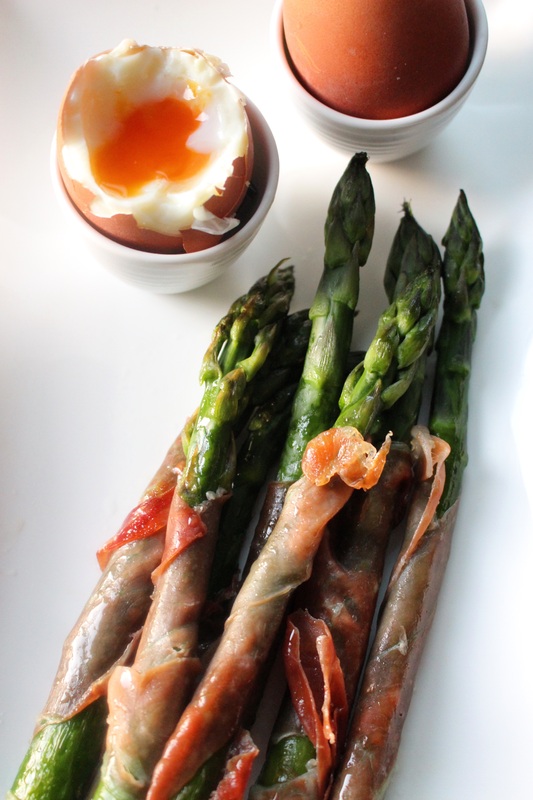 Boiled eggs with asparagus and parma ham soldiers | dash.drizzle.dollop.devour. One bunch or two? I was deliberating my options at the asparagus stall this weekend, when the owner mentioned that next weekend would probably be the last of his harvest for this year, thus prompting an immediate panic-induced purchase of three bunches of asparagus by me. Only two more weeks of asparagus! I feel like I’ve barely got started with it this year. Still, I can easily get through three bunches in a week. This is one of my asparagus favourites and happily it’s quick and easy, so it’s perfect for a weeknight supper or brunch at the weekend. There aren’t many recipes that take less than 10 minutes yet still feel like a treat, but this is one of them. As with so many simple recipes, the quality of the ingredients is key. So to pair with the freshest asparagus I bought some lovely rare breed biodynamic eggs from the next stall along, with beautiful yolks the colour of apricots. It’s worth trying some non-standard eggs for things like this, I find the flavour generally superior to the mass produced kind. Start by snapping off the woody ends of a bunch of asparagus. In a shallow pan, just wide enough for the spears to lie flat, add a generous splash of boiling water and cook the spears for a couple of minutes before removing from the pan and setting aside to cool. Drain any remaining water from the pan and retain. Bring another pan of water to the boil for your eggs. If you keep your eggs in the fridge, bring them up to room temperature by popping them into a bowl of hot tap water for a couple of minutes. This should stop them cracking when you put them into the boiling water. Once the asparagus is cool enough to handle, coil strips of parma ham around the stem of each spear. A whole slice per spear is too much, so I try to cut each slice lengthways into two, which invariably results in it falling apart, but it doesn’t matter, so long as some ham gets wrapped around somehow. Heat a splash of oil in the shallow pan over a medium heat and add the ham wrapped spears. Now put your eggs on to boil. I like to err on the side of caution with my eggs – I don’t know about you, but I think there is nothing more disappointing than cracking into an egg and discovering a set yolk. So I boil them for 4 minutes, but if the chance of a little undercooked egg white would put you off entirely, then you may wish to err on the other side of caution and cook them for a little bit longer. Jiggle the asparagus around whilst the eggs cook, so the ham crisps up nicely. Drain the eggs and serve immediately with the asparagus. A perfect speedy sunset supper. Carol has forwarded this tasty looking recipe to me – I will certainly have a go – it looks delicious! I hope I will be able to continue to read your blog and look forward to becoming far more adventurous with my cooking! Thank you for your inspiration!